Since we're so often in the running (!) for fattest city, it's safe to say that Chicago is a bastion for the country's most caloric comestibles. 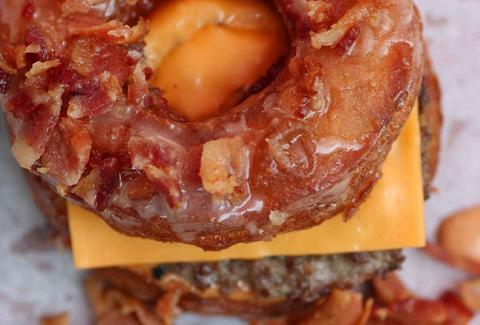 With 2013 finally put down, we take a look back at some of our favorite fatty foods from the year, all of which have a special place in our heart (... right next to the fatty lining of our arteries). When a gelateria like Black Dog hooks up with a wacky donut-ery like Glazed & Infused, fat things happen. 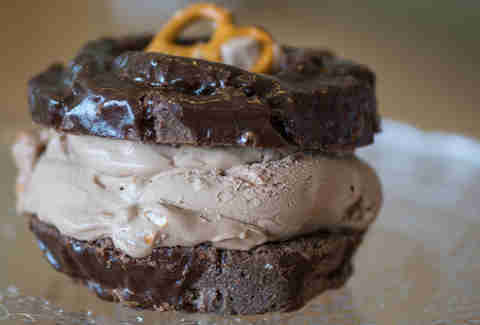 This time, that takes form with this glazed chocolate/pretzel doughnut that's cut in half and then stuffed with Nutella ice cream, all before being topped with an extra little pretzel for fat-flair. 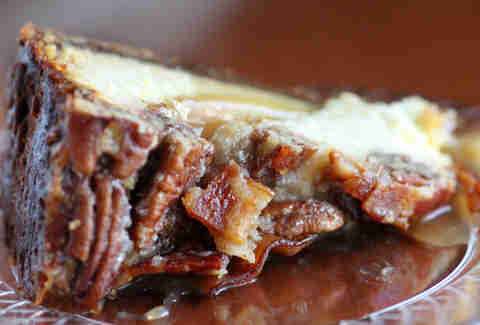 The Bacon Takedown spawned some pretty impressive specimens of baconery, but we've gotta hand the Grand Prize to the Bacon-Pecan Cheesecake -- it's a vanilla cheesecake that's been covered in crispy, smoky bacon, and encrusted with a mix of graham crackers and chopped brown sugar pecans. Delicious? Yes. Kosher? Ask your rabbi. 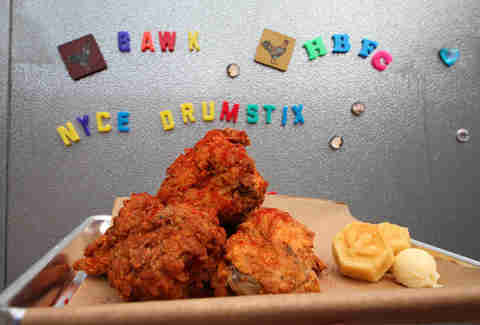 Naming a restaurant Honey Butter Fried Chicken is as unfair as naming your band Everyone Gets Laid. Their eponymous menu item gives you two pieces of white/dark meat chicken that's then coated and deep-fried, spiced to your liking, and served up with a pat of honey butter to apply to either their hexagonal corn muffins, or... THE CHICKEN?! Yep, we think that's a better usage too. 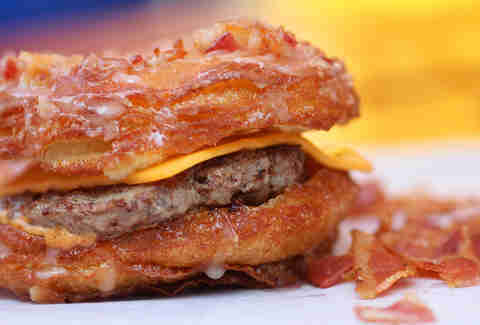 Cronuts are cool and all, but Cronuts ain't got nothin' on this baby: a breakfast sandwich that takes a maple-glazed "crognet" (good luck suing THAT, lawyers), slices it in half, throws in a steakburger, American cheese & spicy remoulade, and then sprinkles the whole thing with bacon bits. They call it The Demon Delight, and it has been known to absolutely demolish a hangover or two. Start with four scoops of Bobtail ice cream (vanilla, chocolate, or strawberry), add in crumbled mini-donuts made from buttermilk batter, blend it all up, then top it generously with whipped cream, chocolate, caramel sauce, and chopped pecans. 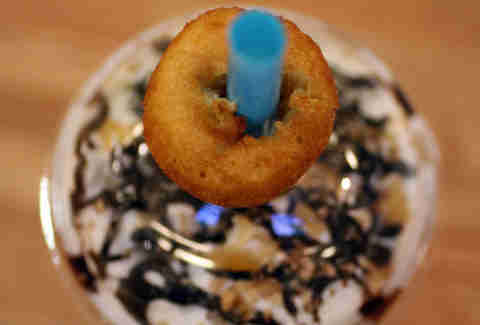 Throw a still-intact donut through the straw, and you have a masterpiece of sugary goodness. David Burke of Top Chef Masters is clearly bacon-obsessed, as evidenced by the fact that he opened a bacon bar where everything (sandwiches, buns, wraps, COOKIES) has bacon in it. 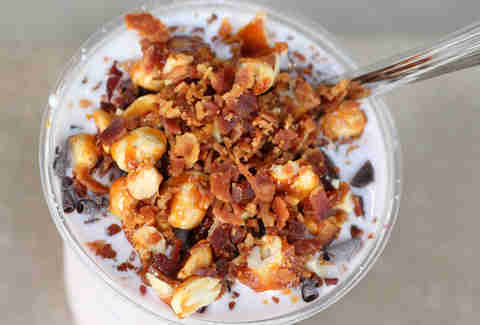 To wit: this soft-serve vanilla flurry topped with whiskey-soaked cherries, chocolate shavings, chocolate sauce, and a bacon brittle topping. It's perfect for satisfying the dessert-loving kid in you, while also helping you to hit your bacon and whiskey man-quotas. 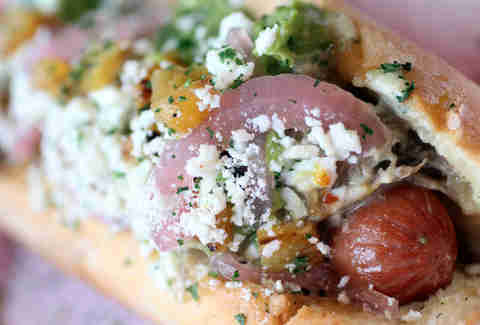 Get transported to tropical island paradise with this hot dog from Hoppin Hots (the best tropical island paradise of all), which's topped with teriyaki pork, pineapple relish, pickled red onions, crushed avocado, and Cotija cheese. Stuff your face with plenty of these and you still might be able to gurgle out an affectionate "mahalo". 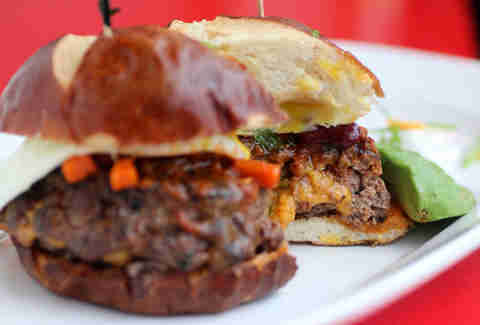 Noodle-bunned burgers are all the rage nowadays, kiddos. Ramen, lasagna... you name it! Soon buns made of bread will only be a relic you tell your grandkids about as they sit on your very large, doughy knee. 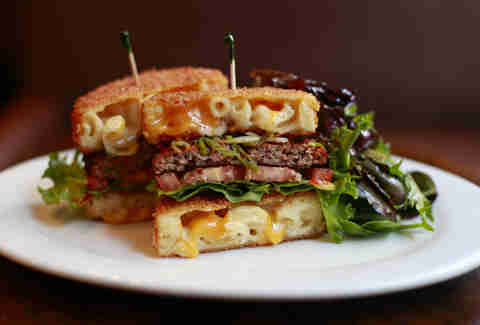 There's a new incarnation of this trend rearing its head where they've taken two patties made out of mac & cheese, deep-fried them, and stacked black Angus beef, tomato, greens, and Sriracha ketchup between them. The place that churns out this stuffed chili burger in Chicago is owned by the waffle-slinging team of, uh, Waffle, and it turns out that golden nook-and-crannied deliciousness isn't the only thing they excel at. This here burger's stuffed with sharp cheddar cheese and jalapeños, covered in sliced avocado, and blanketed by a fried egg -- all between artisanal pretzel buns that sop everything up. And that may be the sexiest use of the word "sop" ever. Don't Google it. 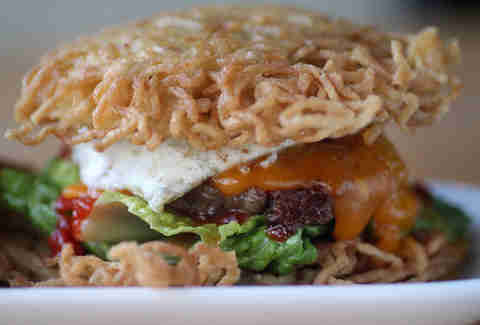 As previously mentioned, buns're being made out of all kinds of things nowadays, but none have captured the public's eye quite like ramen burgers. This one's unique in that the ramen buns are BUTTERED before they're griddled, and the Kobe beef burger within's topped with a fried egg, gooey sharp cheddar cheese, sun-dried tomatoes, arugula (for your health), and Sriracha sauce. Kinda reminds you of college, huh?